Jakwob aka London-based producer, DJ and multi-instrumentalist musician, James Jacob, recently released his latest track on Digital Soundboy. With Shy FX on A&R duties, Digital Soundboy is home to some of electronic music’s freshest talents including Breakage, Dismantle and Radio 1’s B. Traits, with a back catalogue of releases that include Skream, Benga, Redlight, Caspa, Rusko, Calibre and DJ Fresh. 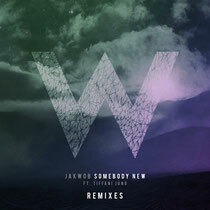 ‘Somebody New’ is out now and marks his first release for the label following collaborations with Charli XCX, Ghostpoet and Kyla La Grange, remixes for music royalty including Usher and Lana Del Rey, and last year’ single ‘Fade’ which saw heavy support from the likes of Zane Lowe, MistaJam and Huw Stephens, racing up to the Radio 1 B-list and positionin Jakwob as possibly one of the UK’s most talented producers on the rise.